GE's former 747 flying engine testbed makes its final landing on Nov. 15, in Tucson, Ariz., where it will become part of the collection of the Pima Air & Space Museum. It was the oldest active 747, having served 21 years with Pan Am before being acquired by the engine maker, and flying for another 24. 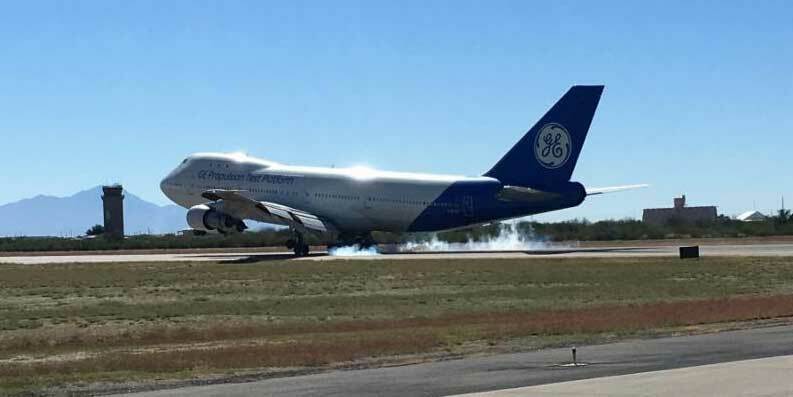 After 24 years serving as a flying engine testbed, GE Aviation’s original Boeing 747 made its final flight last week, from the company’s flight-test operation in Victorville, California, to Arizona’s Pima Air & Space Museum, where it will be retired. The four-engine jumbo jet was the oldest 747 in active service, having rolled off the assembly line on October 17, 1969. It made its first flight with Pan American World Airlines the following March. Pan Am flew the aircraft, named Clipper Ocean Spray, for the next 21 years, logging 90,000 hours and nearly 20,000 cycles. Once acquired by GE in 1992, the aircraft underwent significant modifications to prepare it for its new test career. Passenger seats were removed and the airframe was strengthened for flight testing and the installation of data systems. During its GE service, the 747 provided flight data on more than 11 distinct engine models, ranging from widebody powerplants including the GE90, GEnx, and the Engine Alliance GP7200; to the narrowbody CFM56 and Leap; to the CF34 for regional jets, and most recently, the Passport on the newly certified Bombardier Global 7500. The aircraft made its last test flight in January 2017. In 2010, GE purchased a newer 747, from Japan Airlines and converted it into the Propulsion Test Platform. With its improved capabilities, it has supported the Leap and GE9X programs.